Today we have a guest post from Richard. This post shares some data that I think many readers will find most intriguing. A true “before and after” free float accuracy comparison. Without further ado… Is Free-Floating an AR15 Barrel Worth it? The AR-15 type rifle has surged in popularity and availability in the last few years, and perhaps the most common decision a potential buyer or owner has to make is whether to use standard hand guards or to use hand guards that free-float the barrel. I’ve purchased and built several ARs and I’ve always resisted the temptation to spend the extra money to equip one with a free-floating handguard. I’ve been told repeatedly that a free-floating handguard will increase accuracy by reducing the contact points on the barrel, allowing it to vibrate freely, and it seems that every “tacti-cool” rifle offered has one, and yet I resisted. I searched but I could not find any before and after tests that showed evidence that free floating a general purpose AR was worth it, so I decided to try it myself. I would test a single rifle that used standard handguards, change that rifle to use a free-float handguard without any other changes being made, and then test that rifle again. When we say that free floating a barrel improves accuracy, what we really mean is that it improves precision, the ability of the rifle to shoot the bullets to the same spot each time. The precision of a rifle is determined by shooting several rounds at the same point of aim and then measuring the size of the group, and the smaller the group, the better. The most common and simplest measurement method is to measure the distance between the farthest two bullet holes. This is called the extreme spread method and it’s very easy to do. However, all it really does is tell the distance between the two worst shots. It tells nothing about the consistency of the other shots in the group, and this consistency is really what we want to discover. A better method is to find the center of the group, then find the average distance of the shots to this center. This is a more technical method, but it gives information about each and every shot in the group. I used this second method, called the mean radius (or average to center) and I used groups of ten shots each. Since this method is rather technical and tedious to do by hand, I used a software program called On Target, available for free on the Internet. The rifle I used was a factory assembled BCM flat top upper receiver with a 20-inch 5.56 chambered government profile barrel with a 1/7 twist rate using standard hand guards. This is as close to a GI rifle as I could find. This upper was mated to a generic lower receiver with a fixed stock and a standard trigger group. For an optic I chose a SWFA 10x Super Sniper mil-dot mounted in an American Defense Scout mount. The ammunition tested was a variety of target, varmint, and hunting loads, all factory new and commonly available. Since a standard box holds 20 rounds, I used a single box of ammunition for each test- 10 rounds for before and the remaining 10 rounds after the handguard change. The stock rifle was tested from the bench using front and rear supports and a 10x optic. For the free-float handguard I settled on a two-piece unit from Midwest Industries that allows for assembly without removing the barrel nut or barrel, their Gen2 model. I chose this product primarily because it is very easy to install, does not require any serious gunsmithing or tools, and does not require any alteration or adjustment of the barrel. This last part was very important for I did not want to change or alter anything but the handguard itself, leaving the barreled action the same as it was before the change. In this way any difference in the precision of the rifle after the switch can only be attributed to the change in handguard. The rifle after the change to a free-floating handguard. At the shooting bench, I used a front support placed in the middle of the hand guard and a rear bunny-ear bag. I used typical benchrest shooting techniques and fired in a continuous string with about a minute between each shot. Targets were placed at 100 yards and I chose days with the same weather conditions for both tests. I realize that perhaps the biggest variable in this experiment is my shooting skill, and so I spent several days at the range simply practicing my technique and making sure the gear worked as I expected. Believe it or not, shooting is work, and it took more than a few trials and adjustments to become convinced that I was shooting the rifle as well as could be reasonably expected. But it was enjoyable and it was satisfying to seriously test my shooting ability. Results for 10-shot groups shot from the bench at 100 yards, average distance to the center in inches. A negative percent change means the groups were reduced in size. As seen from the data table, most of the ammunition showed a reduction in group size after the handguard change. I was surprised at how great some of the differences were, leading me to the conclusion that the results may depend greatly on the type of ammunition used. But two of the selected ammunition loads unexpectedly grouped larger after the switch. I convinced myself that there must have been some error on my part in the second test and so I went back to the range on a similar day to re-shoot those two underperforming loads, but I got nearly the exact same results. I’m not sure what to make of that. Perhaps I simply had a fantastic day at the range for those two loads the first time out, or perhaps the barrel has specific ammunition preferences of its own. Most improved: Federal 62 gr Fusion before and after. Note that the extreme spreads (Max) are nearly identical, but the mean radius (ATC) is much smaller for the second group, indicating that the majority of the shots were closer to the center. Granted, my results are only those of a single test, and may not be typical. But if I were to draw a general conclusion, it would be mixed. Taken as a whole, the average reduction in group size for the various ammunition tested was 23%, which is significant, but not all of the groups were reduced, and the results varied widely. For a rifle suited for defensive or patrol purposes, even the worst group with Federal FMJ ammunition using the original standard handguards was still easily capable of producing a 2-2.5 inch sized 10-shot group at 100 yards, which is more than adequate for hitting man-sized targets out to 500 yards. A quality basic rifle has the potential to shoot very well. 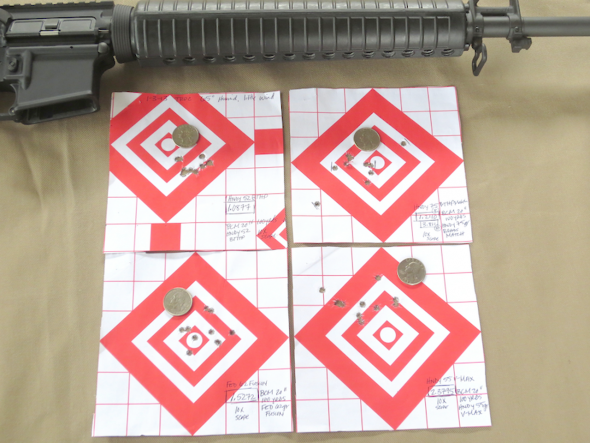 This 10-shot group was produced by the rifle tested in this article after free-floating the barrel and using 52 gr Sierra MatchKing handloads. Interestingly, I was able to draw a few more conclusions from this test in addition to the question over free-floating the barrel. In my time practicing to check the equipment and refine my skills, I discovered that ammunition quality was more significant than I realized. Several of the inexpensive loads that I intended to test had to be abandoned because they were simply junk, incapable of producing reasonably repeatable groups. These are loads that I regularly use in informal shooting, but they were unsuited for accuracy work. You must use quality ammunition if you wish to realize your rifle’s potential. Another item I overlooked was the trigger. My stock trigger wasn’t bad, but after hours of trying to work past the creep and grit I became frustrated and impatient with trying to break the shot cleanly. I recently purchased an upgraded trigger and I really appreciate what smoothness can do for a precise shot. A variety of commonly available ammunition was tested, including different bullet weights and styles. My bottom line advice would be this: For a general purpose AR-15, either for a patrol rifle or home defense, a free-floating barrel is not an immediate necessity. A quality basic rifle will perform quite well, and the standard handguard design offers more than enough accuracy potential for general duty use. If you are looking for upgrades or improved accuracy results, I would first recommend spending money on high-quality ammunition, a good optic and mount, and perhaps a smooth trigger, in that order. The next investment would be to spend time at the range learning to shoot the rifle up to its potential. Only after success in these areas would I then consider free-floating the barrel. Richard teaches high school mathematics and physics as a profession. For leisure he spends his time behind a book or a trigger. Never having been in law enforcement or the military, he writes strictly for the perspective of the armed citizen. I see a free floated hand guard as a nice upgrade but not necessarily a needed one. It boils down to the combination of shooter, ammo, knowledge of equipment, and understanding the realistic limits of all three. I run a 20″ fn upper with a ras5 rail. It’s nice to see a side by side comparison. I think the whole free float thing is overblown for most people. Sure, it has an effect. But, would the average AR owner blasting away at 25 yards really need to worry about it? Probably not. That said, I still find that free float has a more dramatic difference when shooting sling tension is a factor. I have a few non-FF AR’s .. they are mostly pencil barrels .. & under sling pressure they change the poi. Otherwise .. my non-FF barrel AR’s shoot lights out. It looks like you retained the standard front sight and corresponding front retention spacer for the stock handguard. Your description of the “free floated ” hand guard” leads me to think that you did not have a free floated hand guard after all. The two piece item that you installed contacts the barrel nut and the front sight, thus it is not a true free float device. Thus, I believe, from my own experience, that your results were faulty. Having installed many true free floated hand guards, I have experienced a notable improvement in accuracy over a barrel that touches the hand guard in more than one place. I would suggest that you have a true free floated hand guard installed by a competant firearms mechanic and that you try again for real results, as your experiment is based on faulty assumptions and not a true free floated barrel. Good luck. Hard to tell from the pic, but the cap may barely be contacting. MI does have an F-F quad rail: https://www.midwestindustriesinc.com/product-p/mctar-22g2-blk.htm. HRB, the MI quad rail you linked to is the one I used in the test. Both my AR15’s have 20 inch chrome lined barrels. One has a BCM government profile. The other has a Criterion hybrid profile hand lapped barrel. When I built these rifles, I used a free floating hand guard on both of them. While I am in complete agreement that a free floated barrel isn’t a requirement for general shooting, I am hooked on not having to time a barrel nut so from now on, every AR that ever ends up in my safe will have a free floating guard. Great article Lothaen, keep em coming!! Love the riflemen approach taken in many of your writings. Some of the best coffee reading material out there! The above article is a guest post from Richard and all credit goes to him for his hard work with this article. I stand corrected sir, thanks to Richard for the great article. Keep em coming guys well worth reading each and every article. Your guys hard work and writing ability is much appreciated. Good article, Richard. I guess i’ve never actually seen a side-by-side comparison of FF vs. non-FF before. I wonder why I believed that they improve accuracy if I’d never seen any evidence. I do think it’s funny that the 2 best loads ended up being the only ones that grouped worse! That’s just the nature of the beast, I guess. Guys, has anybody tried the barrel shimming process done by MSG Joe Carlos? He’s got some very good you tube videos out on barrel harmonics. This morning I was watching how he fine tunes bolt carriers with 2 milled and staked inserts at the rear of the bolt to eliminate any play on carrier group. Stated that it improves groups by 8.8% If I heard correct. He’s very interesting to watch. Wondering if anybody has run any of his builds or tried some of his ‘smithing’ solutions. Thanks sunshine, and yes, the two Hornady loads that got worse really puzzle me. But when I shot them again later I got the same results, so I have to conclude that the second set of data is valid. I can only think of two alternatives. The first is that the before and after groups are both truthful representations and therefore the barrel harmonic changed in such a way as to make that ammo perform worse than before. This goes against the “common sense” expectation that free floating universally improves performance. The second alternative is that the first set of groups were accidentally better than what they should have been and not a true representation of the norm, and so the “after” group falsely appears to be worse. A better test would be to perhaps shoot three to five separate groups of 10-shots and take their average, thereby minimizing any extreme results, good or bad. Good article. I believe that there is improvement in free floating however most shooters never reach the full potential of their rifle before making changes to fix the fundamentals. I am still looking forward to the atlas review lothean. Keep up the good work. Great article, this is the reason I subbed this blog because if you look around you will find nobody is willing to do this exact test. I was actually surprised at the results to be honest I’ve always figured free floating was more marketing than results but this has helped me change my mind. I still think it’s unnecessary for most peoples intended use but at least I finally see some testing on it. I did a similar before/after test with one of my carbines except I changed to a long FF handguard out over a low profile gas block, with a handguard mounted flip up front sight in place of the standard triangle FSB. My accuracy results were similar (except for those two groups that got larger, that’s weird). Even though the accuracy difference is small, I still went ahead and upgraded a few other ARs after testing. One thing I like in awkward position match style shooting is the ability to brace the handguard against barriers with no POI shift, or the ability to snug a sling around your arm nice and tight, again with no POI shift worries. I’ve also found that I can run a light weight profile barrel with a very light handguard and actually save weight over the standard plastic handguards and triangle FSB, again without worries of POI shifts due to pressure..